A lady dropped these placards around on the Metro yesterday with a little pack of tissues. 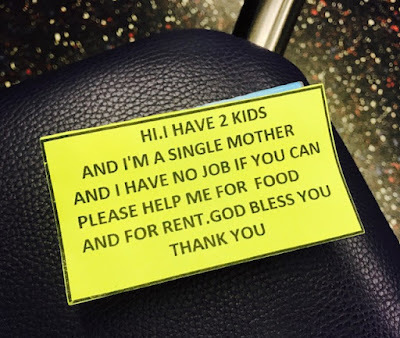 "Hi, I have 2 kids and I'm a single mother and I have no job. If you can please help me for food and for rent. G-d bless you. Thank you." It is heart-wrenching, the poverty! People without food or shelter. Many without medicine and proper clothing. Basic things that most of us take for granted. It takes so little for everything to go to sh*t.
Both individually and also societally. The world can be a cruel, cruel place. But people can open their hearts and wallets to help others. Also, advocate for people that are less fortunate. Labels: Advocate, Caring, Charity, Civilization, Cruelty, Faith, G-d, Giving, Gratitude, Hearts, Helping People, Humanity, Kindness, Metro, Miserly, Needy, Poverty, Wallets, Washington D.C.